Let’s start with the recipe ! The practice of sound can be conceived, thought and realized in a body, in a spirit, an author, an artist. But the sound can also be shared. And what’s better than the pleasures of the mouth to get in touch with the sound material. These sound materials brought by the participants of the Sound Studies of this season, are staged, implemented within a recipe that has become a graphic score. Everyone bringing their ingredient and finding the right balance, to feast your ears and your spirits. Antonella Fiori came to read excerpts from her magazine : « Le Chum Rose n° 3 » revue courtoise et ménagère parmi cet univers sonore. (Journal intime, théorique et pratique de la couturière CITY Météor | Antonella Fiori (extraits)). 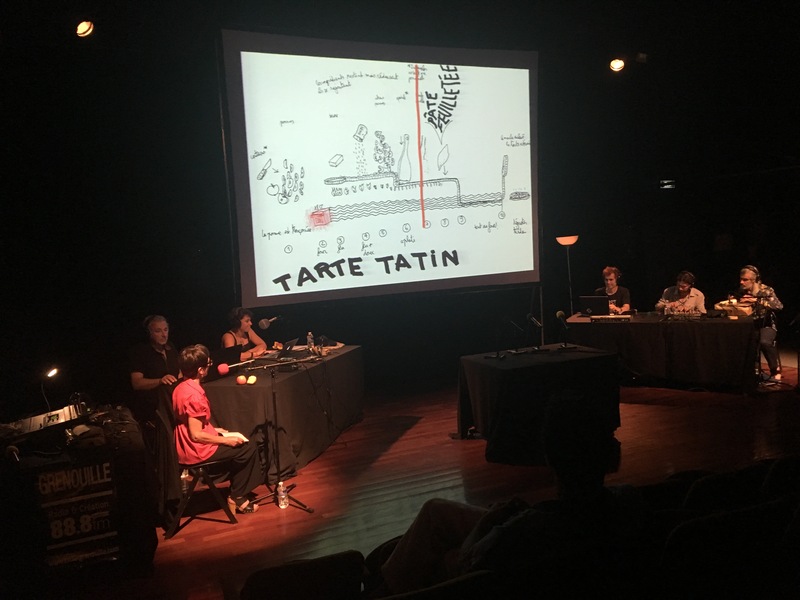 Les Études Sonores, cycle of workshops co-produced by La Cité de la Musique and Radio Grenouille-Euphonia. This entry was posted in #41 and tagged Radio Grenouille. Bookmark the permalink.